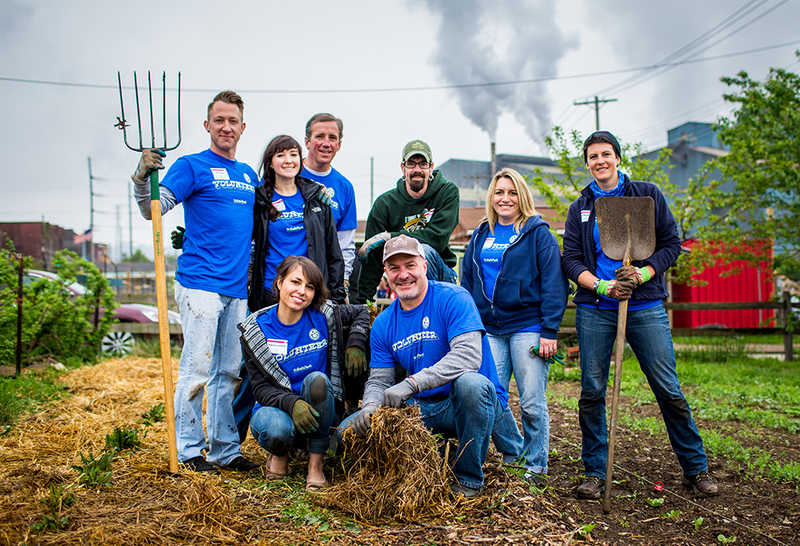 Giving back to our communities is one of the fundamental pillars of our company culture. Many of our team members are active volunteers in their neighborhoods and we strive to recognize those who have gone above and beyond by generously giving their time and energy to support causes in their local communities. From over 1,300 team member volunteers, we have narrowed it down to seven finalists for our annual Eat’n Park Hospitality Group Volunteer of the Year Award! Read on to learn about our 2017 finalists and keep an eye on our blog for the announcement of our winner in late April. Jamie views her restaurant’s community outreach as playing a critical role in McKeesport. She specifically utilizes her restaurant’s Caring for Kids Campaign towards this effort. She ensures that her campaign brings community members together. Additionally, she participates in McKeesport’s annual parade and Christmas tree contest to increase awareness of Caring For Kids not just as an Eat’n Park fundraiser, but as a community asset. Jamie also supports the Volunteer Firefighters of McKeesport and rallies her fellow team members to contribute to various donation drives. She was nominated by her former General Manager Michelle Coyne. Despite Sydney’s busy schedule, her volunteer work is an integral part of her life. She is a full-time student, works two jobs (including serving at Eat’n Park), and is a very committed volunteer. In fact, she spent 160 hours volunteering in 2016. She is especially passionate about helping women who had been victims of abuse, and spends much of her time at the S.A.F.E. shelter in Clarion, PA. Sydney was nominated by her General Manager Michael Warrington. Jackie finds joy in seeing others smile, which is why she invests significant time helping people in need. She has been on the team at our Murrysville location for only a year and has already won over guests with her servant spirit. Her volunteer work is extensive, but most notably she volunteers with the Leukemia and Lymphoma Society, the Irwin Food Pantry, and the Westmoreland County Food Bank. She also sparked the involvement of her entire high school with her goal to collect more than 1,000 sweaters for the Mister Roger’s Neighborhood Sweater Drive this past November. Jackie was nominated by Raeann Allen, assistant manager. Douglas has a huge heart and a selfless spirit according to his fellow team members. He coordinates his restaurant’s Caring for Kids campaign and regularly volunteers at various charity runs and United Way projects throughout the year. Most of his time is dedicated to serving the hungry at the Wheeling Soup Kitchen. Douglas was nominated by assistant manager Laquan Edwards. Bill is passionate about giving back, as evidenced by the 625 hours he spent volunteering last year. He is very rooted in his local community center, the Joshua House. Here, Bill cooks and bakes for the various programs hosted by the center – he donates not only his time, but also all of the necessary supplies. He even hopes to one day open his own café within the community center so that there is a dedicated space for gathering around food. His fellow team members at Eat’n Park also benefit from his passion for baking – Bill bakes treats every Friday to share with the team. Bill was nominated by manager Jennifer Nicolai. Brettney is described as an “amazing and compassionate human that puts the needs of others before her own.” Within her community, she noticed a lack of supportive services for girls who had outgrown the foster care system. In response, Brettney started her own non-profit, G.O. Girls, with a vision to empower young women to achieve a successful adulthood. She also works a second job and actively volunteers at her church. She was nominated by her General Manager Michelle Coyne. Mary is a long-time team member and is currently the Executive Chef at Kennametal. She gives generously of her time, both at work and through volunteering. She is “highly respected by her team, client, and community.” Mary is consistently quick to sign-up for ENPHG hosted volunteer opportunities throughout the year, but her true passion project is the Fisher House, a home for Veterans and their families. There she volunteers countless hours and enjoys cooking meals for the residents. Mary was nominated by her District Manager Chris Fitz. Celebrate St. Patrick's Day With Sweet Treats!